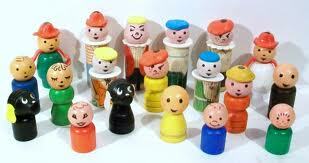 Fisher Price Little People, these were very simple 1971 toys that looked like your dads shaving brush, but instead of a brush at the top you would have a face of a character, that you could swivel around. They would also be dressed up in something relating to the character. Seen them everywhere at the time, but now easily forgettable.